Home > Pianet Parts > New Pianet T / DUO / M "Super Sticky Pads"
Increase the volume and improve the tone of your Pianet T and Duo ! 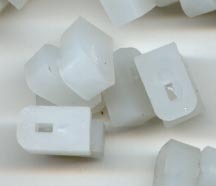 Clavinet.Com has molded new Pianet T pads utilizing the same super-sticky material developed for the older Pianet N models. These new pads will increase the volume, attack and sustain of your Pianet T by at least 40%. These new super-sticky pads miraculously bring the long-forgotten bass notes of your Pianet T to life, as the original hammers never could! Even Pianet T's with lightly rusted reeds can be brought back to life! We have also improved the shape of the keyshaft hole, to firmly hold the pads straight, eliminating the dreaded "twisting" factor that caused the old pads to slide off the reed after continuous playing. Purchase a set of "Super Sticky Pads" today and enjoy a remarkable Rhodes-like tone from a instrument once considered to be the "underdog" of the electro-mechanical keyboard world. For all Pianet T and M Models. These pads also fit the Pianet section in the Clavinet/Pianet Duo. 30-Day Money Back Guarantee. Sold in sets of 61 (60+ 1 spare).